My son is graduating from college, so I’ll be taking a few days off to enjoy the festivities. See y’all on Monday! The purple and pink clouds over the Hudson River were stunning. I knew they would dissipate fast, so I put those in first, then did the rest of the painting. 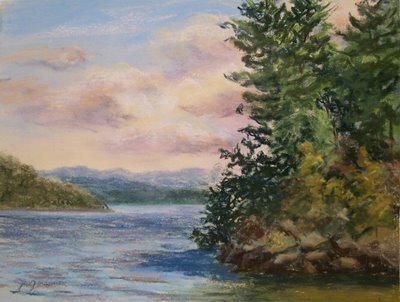 This painting was done on the property of The Brass Anchor in Poughkeepsie, NY. 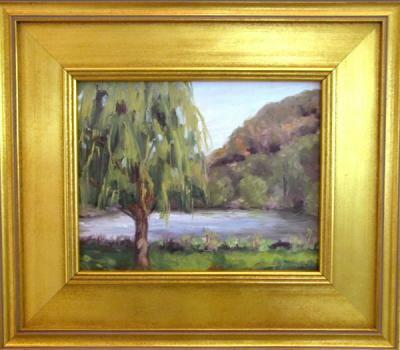 This painting is double matted in gold and ivory, and framed in a lovely cherry wood frame with a thin gold border. Price is for the framed painting. Please email me if you are interested in purchasing the painting unframed. Painted this evening at Rockefeller State Park Preserve in Sleepy Hollow, New York, looking out through the trees to Tarrytown Lighthouse on the Hudson River. 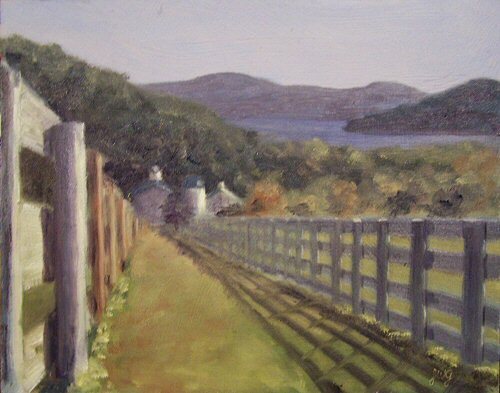 This is the painting I did this morning for the Artists on Location event in Garrison, New York. I painted down by an inlet of the Hudson River along Fair Street in Cold Spring. It was much chillier than I’d anticipated, hence the pun in the title of “Cold Spring Morning”. I framed the painting in my car and drove back to the gallery to deliver it. I’m not sure how accurate the color is on this image, since I don’t have the painting to compare with the digital image. The paintings were auctioned off starting at 5pm. I had to go to my opening at the Bannerman Island Gallery in Beacon, so had to miss the live auction. Tomorrow is the big day that happens twice a year, when up to 85 artists gather in Garrison New York to paint the town and the Hudson River. Each artist has the day to paint on location, and returns the completed painting to the gallery at Garrison Art Center, framed, by 3pm. The paintings are hung on display and auctioned Saturday night. I’ll be out painting with the rest of them! I haven’t chosen my location yet, but knowing me, I’ll probably paint somewhere along the Hudson River in Garrison or Cold Spring. Simultaneously, there is a silent auction ongoing in another gallery at Garrison Art Center. Those paintings are brought by many of the same artists who go out painting. You can read more about the event by clicking the link to Garrison Art Center on the right sidebar here. The Lower Hudson Valley chapter of New York Plein Air Painters has a show opening this Saturday, May 12, from 4-6pm at the Bannerman Island Gallery. The gallery is located at 150 Main Street, Beacon, NY. Come visit if you can! If you can’t make it there on Saturday between 4-6pm, the show runs until June 3, so you’ll still have time to see our work. $245.00 plus $10 shipping and insurance within the Continental United States. For local sales, shipping charge will be allocated to NYS Sales Tax. Please email me at JamieWG@aol.com for International purchases or with any questions. 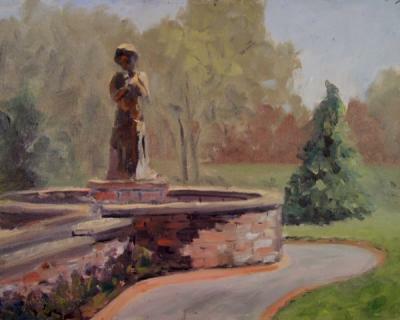 Painted on location along the banks of the Hudson River at the Vanderbilt Mansion in Hyde Park, New York. 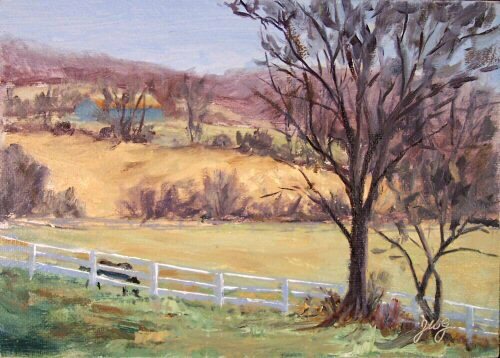 One of my paintings of Tilly Foster Farm has been featured in an article in today’s Journal News. Putnam Arts Council has announced that they are moving to Tilly Foster Farm! Since that is one of my favorite painting locations, I couldn’t be more thrilled. You can read more about it in the article. 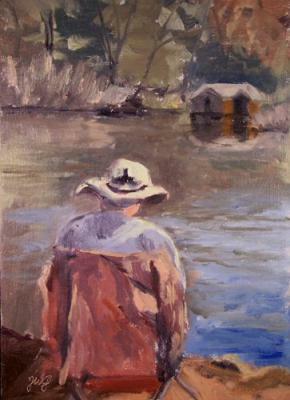 In celebration, I have moved up several of my Tilly Foster works to the top of my blog. Just scroll down the page to view them. I’d like to give a big, warm welcome to any new visitors who have come to my site as a result of the article in today’s paper. I hope you have an enjoyable visit and return often! From up high at the top of the pastures, there is a magnificent overview of the farm, barn, reservoir, and distant hills. This was painted on location there. It was a challenging scene and I almost didn’t take it on, but the view was irresistible. We finally had a gorgeous day for plein air painting here in the Hudson Valley. 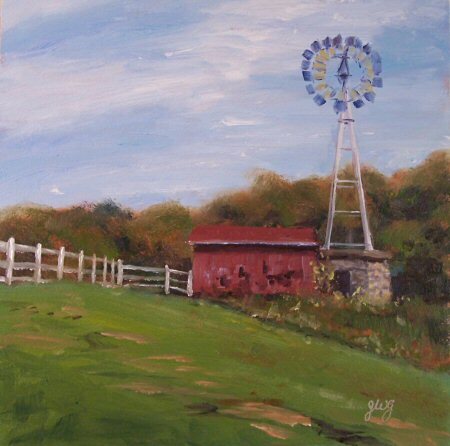 I went with some artist friends to Tilly Foster Farm and got a hefty fix of springtime! Tilly Foster Farm is an old horse farm that was purchased a few years ago by Putnam County to retain as open space. It has beautiful rolling fields, old buildings and barns, and a fantastic overview of miles and miles from the top of the pastures. This painting was done from a photo I took there in the fall. I’ve made a number of sketchbooks over the years and have recently been asked to share some of them. This is perhaps the easiest, most useful, and most versatile of them all. The biggest advantages to this design are that many different kinds of paper can be used for various media and effects, plus the paper can be removed easily for framing. Next, cut various types of paper that you like to use for painting, drawing, and sketching. Be sure to cut the paper about 1/2 inch smaller than the matboard. When in use, you’ll be doubling over the matboard to serve as a firm drawing board. The matboard edges also serve to protect the edges and corners of the paper. 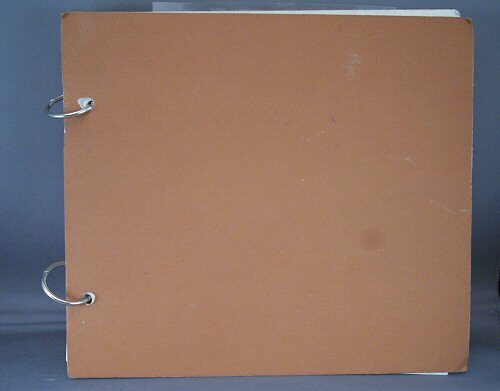 Punch holes in the paper, making sure they line up with the holes you’ve punched in the covers. 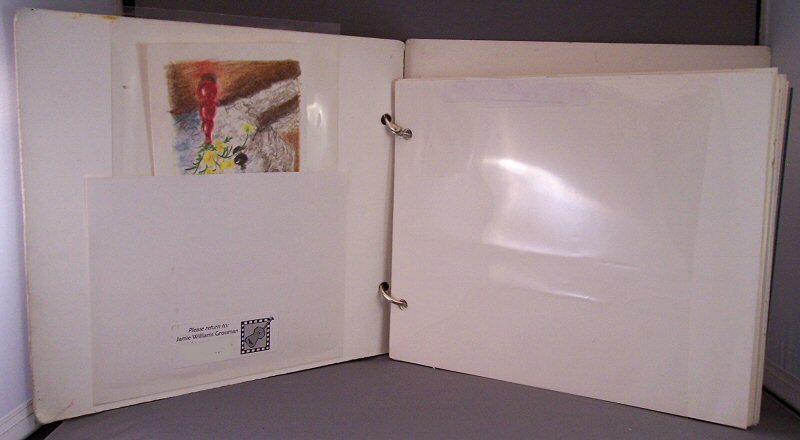 You can paint your cover to decorate your sketchbook, but I just left mine blank. If you use a lot of wet media, consider a piece of foamcore for one or both covers, coated with a couple of coats of acrylic medium, to use as a painting board. 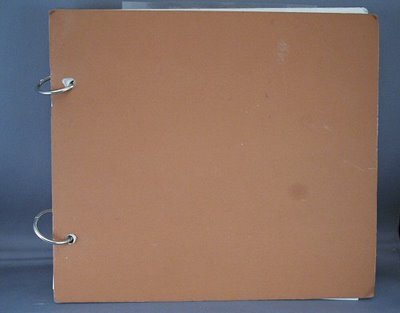 You can even tape paper down to it that way after removing a sheet from the book, or use metal office clips to hold it. Oil pastel and soft pastel artists can include sheets of glassine with holes punched, to place between finished drawings. Glue a pocket to the inside of the front cover. (See image below.) I used this to hold templates for standard sizes. If you have, for instance, a 5×7″ template in the pocket, you can pull it out to draw a quick 5×7 rectangle on a piece of the paper. Then you’ll have a drawing or painting that will fit perfectly into a ready-made mat and frame. The little pocket also comes in handy for photo references, drawings, a ruler, etc. I put a sticker on the inside of the cover saying “If found please return to” with my name, address and phone number. On the right side, the shiny plastic is a sheet of clear acetate. When working in colored pencil or graphite, I’d keep this under my hand to stop the pencil from smudging. I kept another sheet of it in the little pocket inside the cover. You can also keep glassine in the book, or whatever else you use to protect your finished work. I hope this helps some of you who want a sketchbook that can do it all! 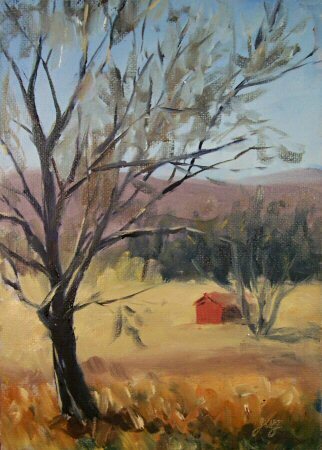 Painted on location at Tilly Foster Farm. This is a little oil sketch of my friend Paula, painted while she was painting at Teatown Lake. What an exquisite spring day we had. 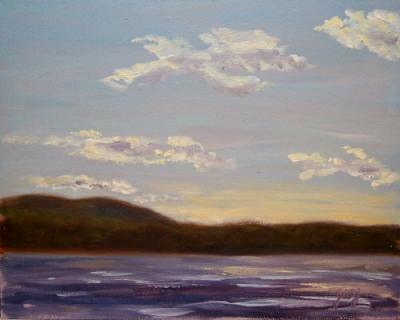 I met with a group of artist friends to paint at Teatown Lake Reservation in Ossining. The lake is best painted in spring before the foliage comes out. Once the trees and bushes leaf out, the lake views are obscured. Plus, the swans are there every spring and are good models! They have a nest near the bridge. I love this scene so much and have painted it many times. It presents lots of artistic challenges, so I go back every spring. Each year, I find I like my painting more than the year before. This one is my favorite from Teatown Lake so far.